And what, exactly, is it that J.D. Salinger has to do with marketing communications? The death of JD Salinger earlier this week effected me profoundly. I had met Salinger during a pivotal time in my life. I had just finished my MFA in creative writing from Columbia University and found a wonderful job at the archaic literary agency, Harold Ober Associates. That was in 1985, when Harold Ober was run by the grande dame , the elegant Miss Dorothy Olding. The agency was a relic already, more like the Old Curiosity Shop than a modern literary agency. There were still dictaphones, a telex machine, carbon paper everywhere and not a photocopier in sight. It was that April, April 12th, to be more specific, when I had the opportunity to meet J.D. Salinger himself. And the end of that story has something to do with me joining in with those New York advertising men who monopolize phone lines. For the full story, well, that is something that you and I will have to discuss at lunch or over a drink some day. You may be gone, Jerry, but your spirit is still with us. PS — Yes, that is his real signature. Some more insight from our new CMO study into marketing tools and techniques. We surveyed 130 CMOs and marketing decision makers about marketing methods, tools and techniques. In this post and some earlier posts I have been sharing topline findings from the research. I compare marketing last year to a deep freeze. Budgets were frozen, projects were frozen, innovation was frozen. Last year pretty much everyone was focused on retrenchment. They need to justify marketing spend with quantifiable ROI, cutting out costs, re-organizing the marketing functions. Our study shows that marketing is clearly thawing. But it isn’t even. Some companies have moved forward to take advantage of the situation. And others are still in a deep freeze. We are now seeing 2 distinct segments of marketers. [A special acknowledgement to Frank Woei of Bellwether Interactive for uncovering this]. One segment is the “Evolvers”. This group is maximizing the situation by seizing new opportunities. They are prioritizing evolving their marketing to match evolving business strategies, and preparing for the economic upturn by improving their brand image and reputation. The other segment is the “Re-organizers” This group is still frozen in place. They are analyzing and re-evaluating everything, seeking that measurable ROI and cutting marketing costs everywhere possible. In past recessions we have seen that some companies have a great resilience and come out relatively stronger than going into the recession. We are now seeing evidence that the pattern is repeating in this recession. Hyundai and Apple immediately come to mind as winners emerging in a changed marketplace. 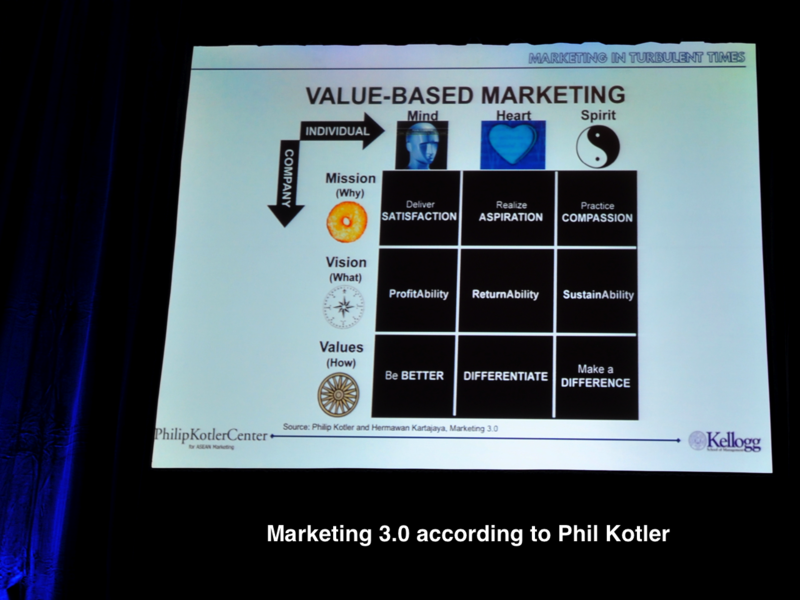 In his presentation Philip Kotler proposes Narrative Branding a one methodology to replace brand positioning. 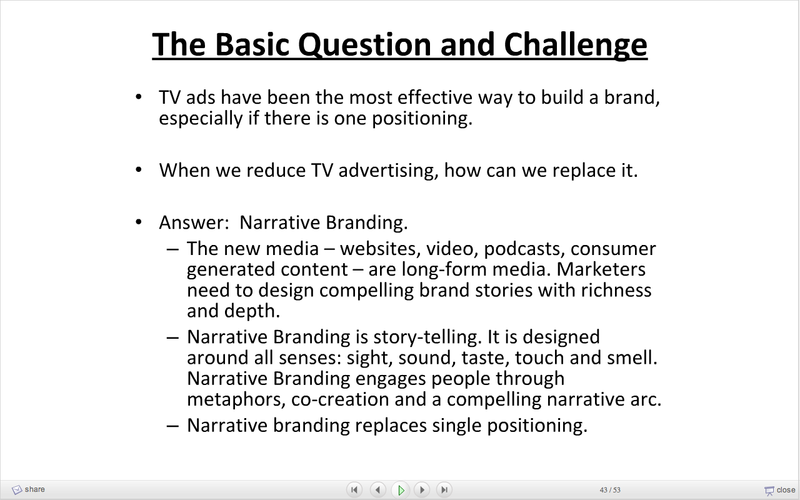 As the world moves beyond the single-minded 30 second TV ad, brand positioning loses effectiveness. 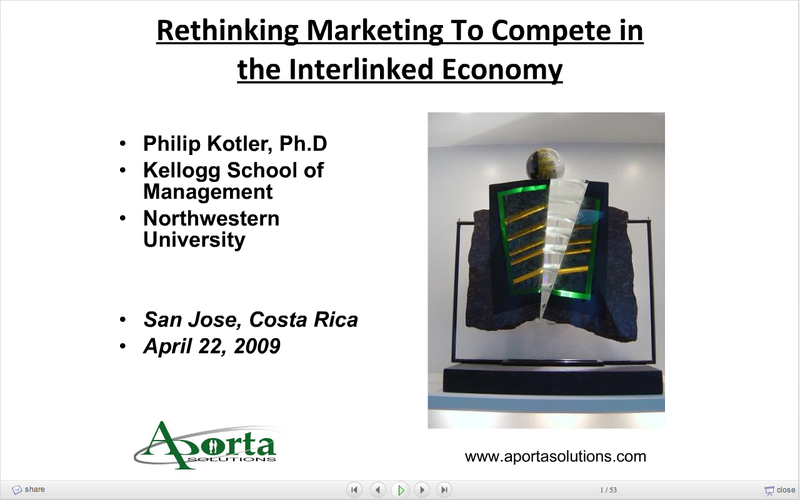 Kotler presents Narrative Branding as the way to reach multiple audiences and to make most effective use of all forms of media. 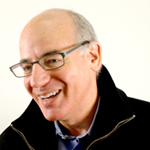 While I wasn’t at this presentation, I have read interviews in which Philip Kotler also discusses Brand Journalism, pioneered by Larry Light (CMO of McDonald’s) and Joan Kiddon as a similar approach to Narrative Branding. 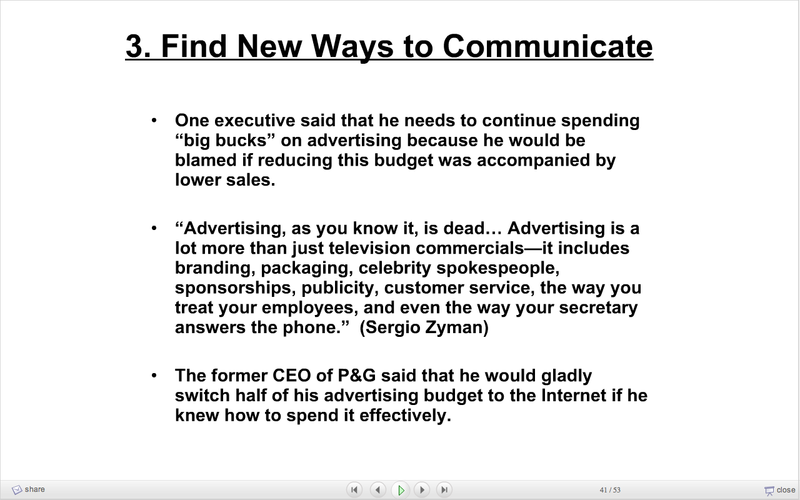 You can get the whole presentation from slideshare. The marketing landscape is shifting. The big news is the growing importance of corporate social responsibility to improve brand image. That has jumped 13% points from 19% to 32% in 2010. While it is not a top 3 trend, it has not been stopped by last year’s economic pressures. The growth of social media is now the #1 most important marketing trend for 2010. That is up +6% from last year and replaces last year’s “shifting from traditional media to digital media” as the most important trend. More to follow as we dig deeper into the data and find knowledge. Again, thanks to Frank Woei at Bellwether Interactive for their great work fielding this study (bellwetherinteractive.com). As I promised in early posts, the new data from our annual CMO study will be put online here before we issue our formal report. This year the study was fielded by the good folks at Bellwether Interactive, led by Frank Woei. Last year the study was fielded by Forrester (formerly Jupiter Research). The study is among CMOs and other marketing decision makers at corporations with revenues of $250 million or more (about 70% are over $1 billion in revenues). A major shift in CMO priorities for 2010. Marketers are re-engaging with customers. The focus on cost-cutting and ROI has given way to brand building — or rather, rebuilding after a year of neglect. This is a very positive sign for marketing in particular, for companies that believe in marketing and for the overall economy in general. Marketing plays a vital role in stimulating demand. Without demand, the economy will stagnate. Last night we were down at Fontana’s on Eldridge Street to see a new band, The Hillary Step. About three quarters through their set they made the usual plug for their next gig, the band coming up after them and a Hillary Step Fan Loyalty Program. This is a band that rewards fans! 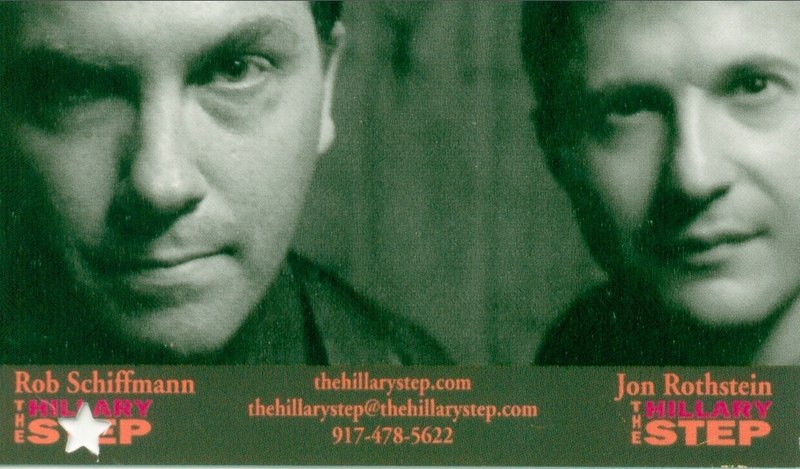 Get a Hillary Step Gig Card from anyone in the band. Come to 5 shows, get your Gig Card validated at each show. Your reward: Hillary Step will come to your home, office or any place of your choice and play a 3 song set for you. If the program is successful enough, maybe they’ll start giving airline miles, too.